Where’s the Capitulation in Precious Metals? – Technical Traders Ltd.
Where’s the Capitulation in Precious Metals? Over the past 20+ years of research and trading in the markets, our team of traders and researchers know one thing is certain, when fear hits the global markets, precious metals react by rocketing higher. We’ve seen this happen over and over again – even when non-US geopolitical concerns spark some true fear in the markets. If you’ve followed our research this week, we’ve been warning about how we believe this move is purely price and technical based and not really a fear-based global price collapse. In other words, our technical systems, price modeling systems, and other advanced price analysis tools are suggesting this move is nearing an end and was likely a function of price rotation and less a function of true fear in the global markets. Yes, there were a couple of key factors the precipitated this price move; the Fed, Earnings, Housing Data, Trade, and Geopolitical concerns and the US Elections. Yet the biggest concern for traders was the “deja vu” feeling that Housing could present another massive crash near an election. We’ve been through that and we know how ugly that can be if it were to unfold again. Our researchers, at www.TheTechnicalTraders.com, spent quite a bit of time going over the data and we continue to believe this downside price rotation in the global stock markets was nothing more than a technical price correction WITHOUT any real capitulation from other commodities. If the recent downside price collapse sowed any real fear into investors, then precious metals should have skyrocketed higher over the past 3+ weeks. This Weekly Gold chart shows how prices advanced moderately over the past few weeks and failed to originate any real broad upside move as equity prices collapsed. Weeks ago, we predicted Gold would climb to near $1235, the CYAN line on this chart, before weakening to near $1200 again near the US mid-term elections. 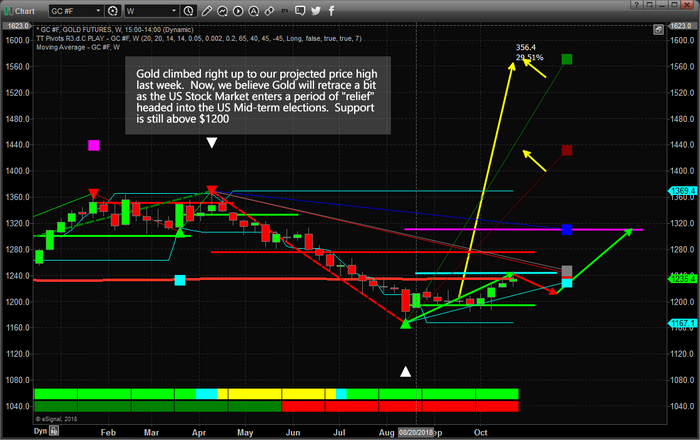 After the elections, we believe that Gold will begin another price advance toward a price target near $1310 headed into 2019. The YELLOW arrow showing the massive upside projections are based on our Fibonacci price modeling system and suggest that Gold may ultimately have an upside potential near $1435 or $1565 eventually. These upside targets, if reached, would be the result of REAL FEAR entering the global markets associated with a much greater contagion/capitulation event taking place. This may be something that happens in the future, as some point, but we don’t believe this is taking place now. 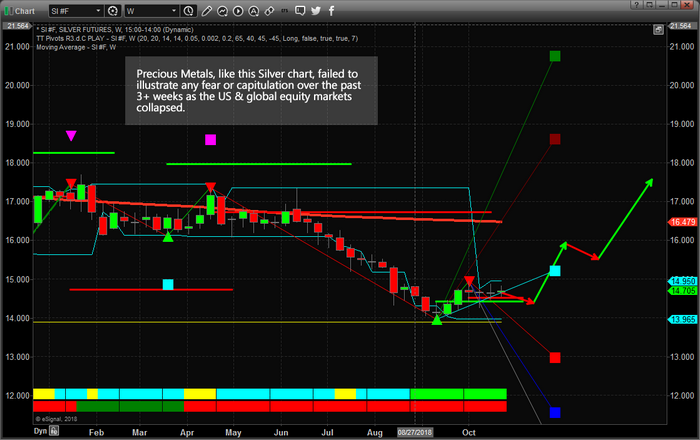 This Weekly Silver chart further illustrates the weakness in the precious metals sector throughout this recent global stock market collapse. The price of Silver actually fell slightly over the past few weeks and stayed near $14.75. A recent double bottom formation in Silver near $13.95 is a very strong indication that Silver is establishing a long-term base near the $14.00 level. You can see from our draws arrows that we believe Silver will continue to contract headed into the US mid-term elections, then begin a moderate advance higher. We are actively searching for new trades within the precious metals sector that present clear opportunities for our members/subscribers as we believe this upside move in the metals will be one of the best trades in 2019. Although, right now, these trades are “setup trade” in the sense that we don’t expect any true fear to change price at the moment. We do expect investors to continue to look towards the precious metals markets as a form of protection from global events in the future and we believe that when the dam breaks and fear really does enter the markets, traders need to already be positioned within the precious metals sector – not chasing after the move. Overall, our question still remains valid – where’s the capitulation in the precious metals? If this downside price movement within the global markets was “the top”, we have yet to see any real capitulation in precious metals, which we believe would be the first place to reflect this true fear. Without this capitulation, our researchers continue to believe this is a technical “reversion” move where price is moving lower to re-establish support for another upside price advance. In conclusion, we do expect moderate price advances in the precious metals sector over the next 4~6+ months. We believe this sector will continue to attract investors as a means of protection against a sudden and more structural price collapse event in the future. Right now, though, we just don’t see the capitulation that would need to be in place if the downside equities move instilled any real fear in traders. It’s just not there – yet. Therefore, this recent downside swing appears to be a capital shift or reversion event where price will quickly attempt to find support, based (headed into the US mid-term elections – as we’ve been suggesting) and begin to move higher after November 12th. Please visit www.TheTechnicalTraders.com/FreeResearch/ to see all of our recent research posts and to help you understand what our researchers believe is really transpiring within the global markets. Additionally, please visit www.TheTechnicalTraders.com to learn how we can help you find and execute better trades and stay ahead of these market moves. Learn how we help our subscribers by delivering specialized content, video, research, trading signals and more. The next few years are going to be full of fantastic trading opportunities. Now is the time to start to take advantage of these setups and create greater success for your future.